A faithful yet mistreated steed, an eggcelent smasher, and a plumber’s babysitter, T. Yoshisaur Munchakoopas, or more commonly known as Yoshi, has had many jobs throughout his history and now he is making a warm and fuzzy return on the Wii U after his latest outing on 3DS, though this time he has ditched his babysitting duties to save Craft Island and its inhabitants from unraveling from existence in Yoshi’s Woolly World! Is Woolly World better than that cuddly bear you still cuddle, or more embarrassing than the christmas jumper your gran got you last year… in June? 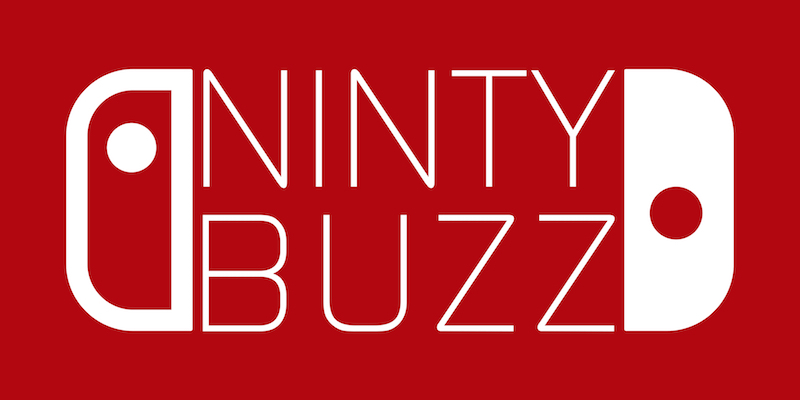 Find out in our review after the break! 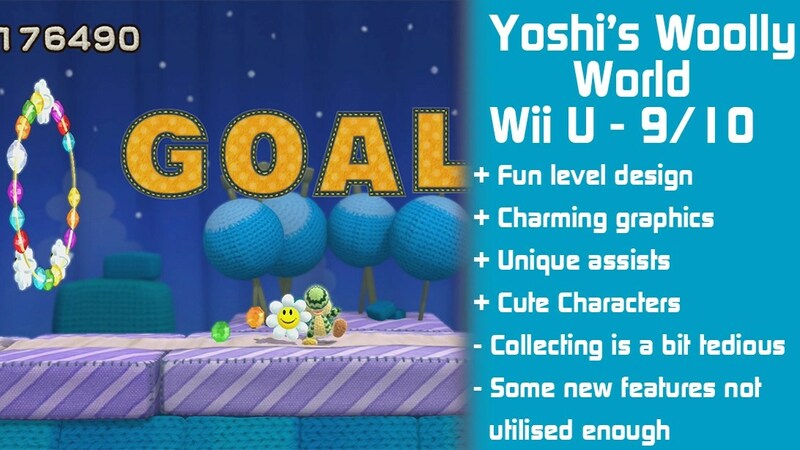 Like with pretty much all Mario games, the story of Wooly World is pretty basic and simple. It starts off on a peaceful island, which is sure to please anyone who enjoys a bit of arts and crafts, called Craft Island. Kamek then enters to stir up trouble as always, this time he uses his wibbly-wobbly magic to unravel all but two of the Yoshi inhabitants and transform them into bundles of wool. 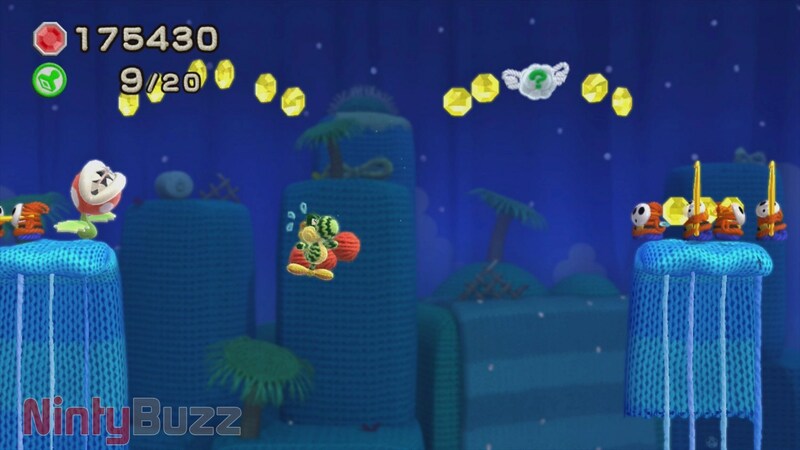 One of the Yoshi’s gives chase, causing Kamek to drop several of the bundles across the different worlds. See, simple! First impressions of the game are really good. 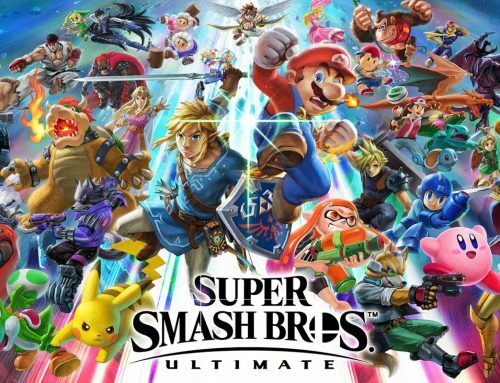 The graphics look really detailed and pretty, I love how you can see some of the stray, fuzzy fibres of all the characters. Everything is made up of craft items such as wool, cloth, and ribbon, even ‘floating’ platforms are suspended by fine wire. I just love the detail put into the environments. Beads replace coins and even the collectible flowers are now in pin form. One thing I think is really cute is how Yoshi’s feet change form depending on what you are doing. If he is running at full speed, his feet will turn into wheels, if he is on the ice, they will transform into ice skates. There are six worlds in total, and they have the general Nintendo 2D platformer theming, Grass, Desert, Clouds, Jungle, Snow, and… well, you can find out what the last world is all about on your own, all I’ll say is that there is a suspicious piece of furniture on Craft Island. Though the theming could use a bit more variation, the levels themselves are mostly quite unique and so many have caused me to smile and laugh while playing, something which doesn’t happen that often with gaming, the level design just feels so fun most of the time. One of my favourite levels involves you having to climb a bunch of hanging mobiles (the things which you see hanging above baby cribs not the portable telecommunication devices we are all slaves to), due to their hanging nature, you have to be strategic to balance out the mobile to get to higher areas, add some piranha plants which spit out rolling pokey poms of doom, and you got yourself a treacherous, yet fun, course. The controls are pretty much the same as previous titles, but there is one difference. If you are using a Wii Remote, you have the option to use motion controls to aim your yarn balls, this makes throwing a lot easier as the aiming is more accurate, especially if you need to throw a ball in a pinch! 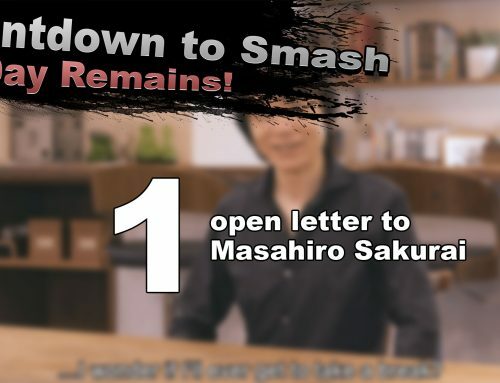 Most of the courses tend to be of a low or medium difficulty, though there are several levels which can really test your Yoshi skills, some of the Ghost Houses were definitely cruel! The implementation of the yarn hosts some interesting gameplay features. For example, when you eventually meet some Boos, you can throw your yarn at them to create temporary balloon platforms… though doing so isn’t as easy at it looks. Though the game does add some new concepts into the Yoshi franchise, it still mostly borrows from previous iterations, and those who have played previous Yoshi games to death may find themselves with a feeling of deja-vu. However, personally, I don’t really mind to much, maybe it’s because the only Yoshi games I’ve played are Yoshi’s Story and half of Yoshi’s Island, but even then this entry feels completely different most of the time. 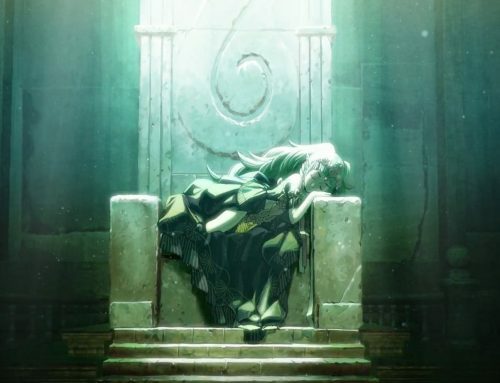 When it comes down to the bosses, some of them are pretty unique, whereas some of them are also pretty simple, I am especially a fan of the final boss of the game… though I will let you readers find out why for yourself! Remember when I talked about how Kamek dropped bundles of wool all over the land when being chased by Yoshi? These bundles are called Wonder Wool, and five bundles are spread through each of the courses. If you collect all bundles from a course, you’ll unlock a very charming new pattern for your Yoshi to play in based on the course you cleared. If you’d love to make your Yoshi your own, then you’ll want to keep an eye out for these collectibles as some of the designs are pretty cute… plus, you wouldn’t want the Yoshi’s to stay unraveled and lost in these dangerous environments, would you? The personalisation doesn’t stop there however. 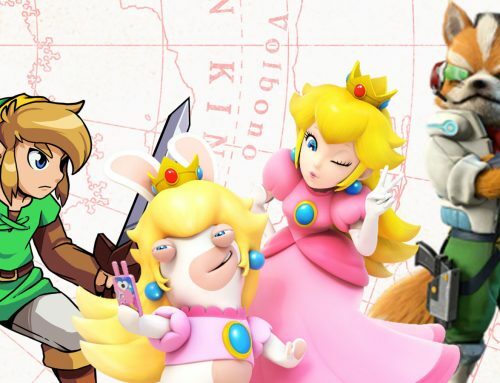 If you’ve been a bit of a collector and have been collecting those Amiibo figures, you’ll be able to collect patterns resembling that figure just by touching it on the reader! Other collectibles include beads, stamps, hearts, and flower pins. The beads act mainly as the scoring of the game, however you can also spend them for a one-use power badge. What is a power badge? Glad you asked! Power badges give your Yoshi a special ability for that course, such as faster movement, invulnerability to lava, and bottomless watermelon seeds. Perfect for if you are having a little trouble with a particular course or if you are just addicted to watermelons. Most of these abilities won’t affect your save file either, unlike the assists from more recent Mario games. Stamps replace the red coins from previous Yoshi games, and once you have collected enough of them, you will unlock more and more stamps to use in Miiverse drawings. Speaking of Miiverse, Woolly World includes some basic features from Nintendo’s social network. 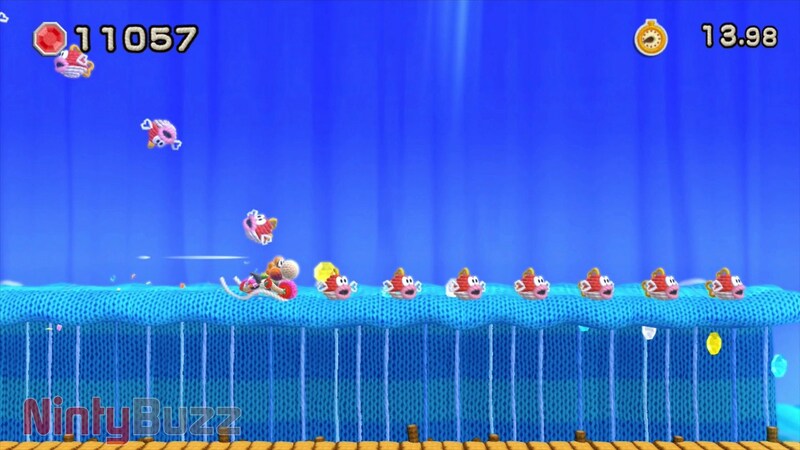 Yarn versions of the Miis of various players will appear around the Carft Island hub, along with a Miiverse comment. It isn’t a huge implementation of Miiverse, but it still adds a little bit charm to the game. Hearts act as Yoshi’s health meter, however on the totals screen at the end of the course you receive a star medal for collecting all twenty, like you would for Wonder Wool and Flower pins. Finally, Flowers make a return, though this time in plastic pin form. Like in previous entries of the series, there are five flowers to each course. 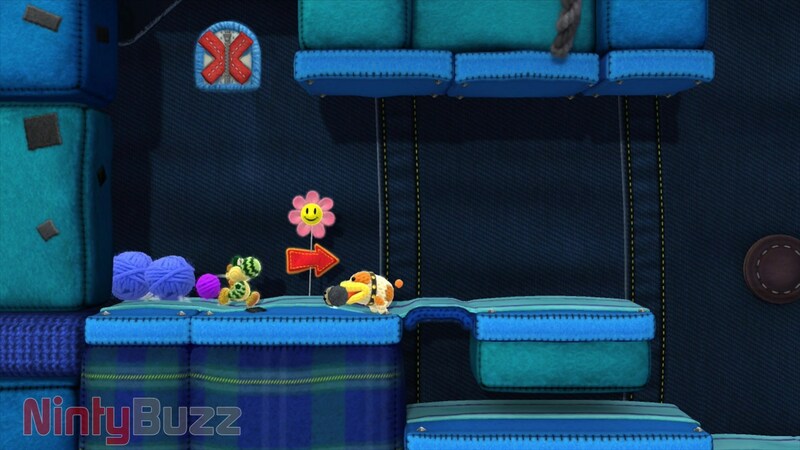 In Woolly World, collecting all flowers from each world will unlock secret courses which really ramp up the difficulty level. For example, 1-S will put your flutter skills to the test as the only platforms are waves, which appear intermittently. There may be an extra surprise if you collect every flower pin in the game too. Flower pins, Wonder Wool, and Stamps are actually usually quite well hidden in courses, and would take a master sleuth to find each and every one. I’ve seen reviews complain how they are too difficult to collect, however I welcome the challenge very much as it encourages you to check every nook and cranny of the course, I’m one of those guys who loves to take in the environment and exploring it. However, I can understand how sometimes it can become tedious and will admit that some collectibles are placed in ridiculous areas. 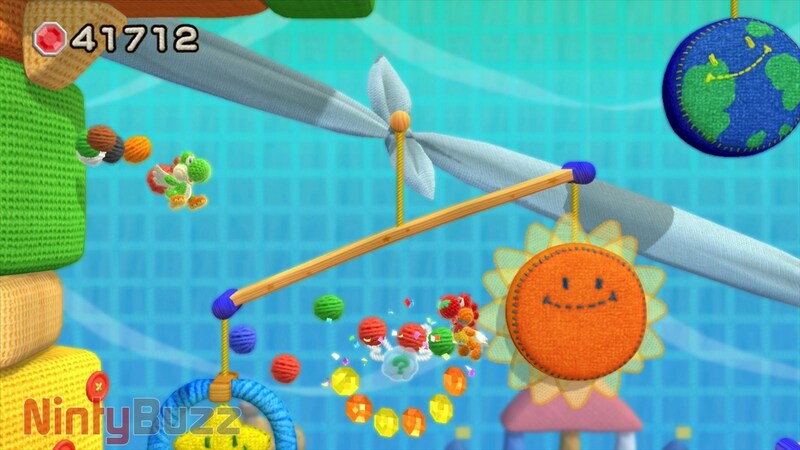 Going back to assists, those of you who have been following the news of Woolly World may have heard of Mellow Mode. Mellow Mode is ideal for casual gamers who play the game. Mellow Mode makes several changes to gameplay, most notably, it gives players a pair of wings, which allow you to float infinitely, perfect if you haven;t quite mastered the Flutter Jump technique. Mellow Mode doesn’t make the player invincible however, you are still vulnerable to enemy attacks and falling down bottomless pits, it just makes the game slightly more enjoyable to play for inexperienced players, which I think is absolutely great. 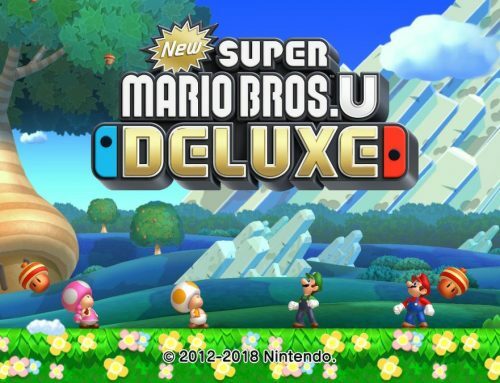 When you look back at games like New Super Mario Bros. U, when you have trouble with the game you are given the option to use the Invincibility Leaf, having that sense of invincibility, for me, may make the game easier, but it just takes out the fun of the game… plus it means that, if you complete the course with the leaf, you don’t get to keep all your goodies unlike when you complete a course in Mellow Mode. There are other changes to gameplay too in Mellow Mode. For example, if you get killed by a boss, you will go straight back to the beginning of the fight rather than to the last activated checkpoint. You are also given improved defence. There are a couple more changes in Mellow Mode, but I’ll let you find out for yourself. What is best about Mellow Mode is that it isn’t forced upon you (other than a notification after you die several times recommending Mellow Mode), you can turn it on at any point in the game through the pause menu, and when you do change mode, you will be dropped back into the game just where you were originally. The mode is also great if you just want to explore the level properly with ease, perfect for finding that last flower pin! There is a Co-Op mode too. If you have a friend or family member who wants to play, they can jump straight in from the Title Screen or right before you enter a course. 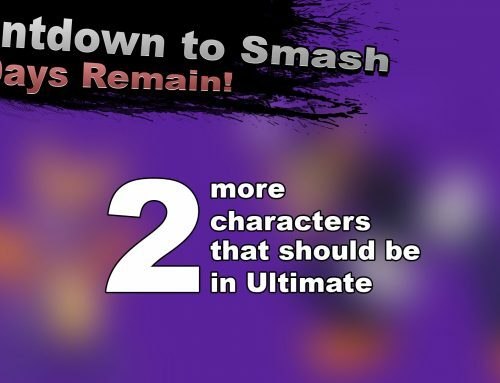 The second player will play alongside you as another Yoshi, this can both aid you and hinder you. The Yoshis can swallow each other and spit them out, they can also be turned into balls to throw, ideal for reaching hard to reach places… or if you just want them to get of the dang way. If one of the players falls in battle, they will reappear almost instantly in a flying egg for the other player to crack open, as the game boasts unlimited lives, you don’t have to worry about dying too many times (cats may have 9 lives but Yoshis have an unlimited amount). One thing which I think would have been nice is if there were a way add a competitive edge such as a mode similar to Coin battle from New Super Mario Bros. Wii/U or even just a separate scoreboard for the second player so you can see who collected the most beads, flowers, or other collectibles. Either way, it’s still pretty fun! 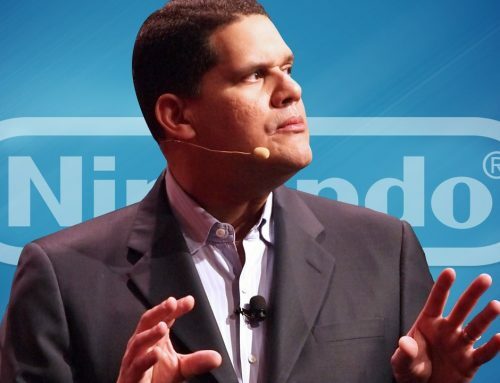 There is even more Amiibo support. 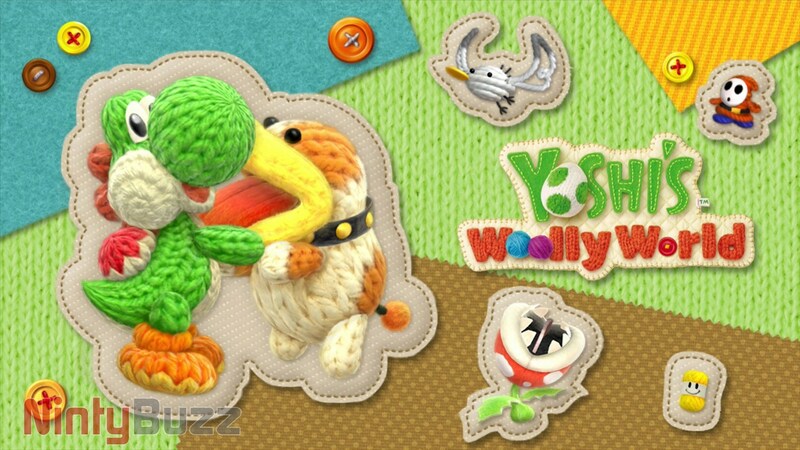 If you use one of the super special, super cute Woolly Yoshi Amiibo, you add a second Yoshi into play which will follow you to the world’s end. You can even swallow it, turn it into an egg, and then throw it to hard to reach places. I haven’t been able to try it out yet, but either way, it seems like another neat Amiibo implementation! 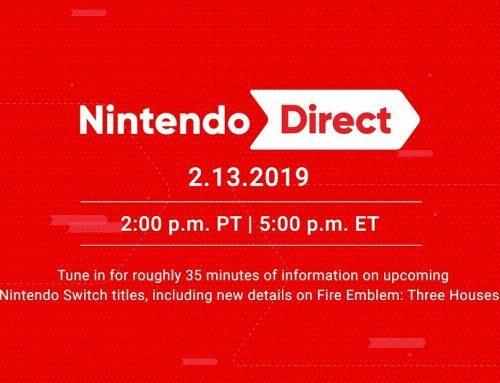 Finally, it wouldn’t be a Nintendo (or Good-Feel) game without some charing characters, and this game has quite a few of them. 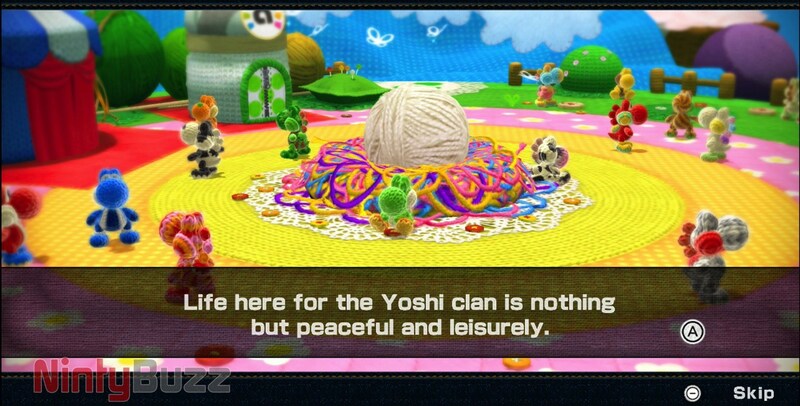 Of course there are Yoshi’s in their very colour splendour, but even the enemies look pretty cute in wool whether it’s the chain chomps you can tame with a string of yarn, or a Shy Guy behemoth covered in ice. Pooch the dog also makes a return and he is as awesome as ever, it is especially cute when he is able to fetch. Perhaps it is the arts and crafts art style which adds to the charm as it fits so perfectly in the Yoshi World. Even in freezing levels, the yarn still adds to the charm. To top it all off, the music fits in so well and is so awesome, so awesome that I have included some samples at the bottom of this review. I still wish, however, that they would’ve reused some tracks from Yoshi’s Story! 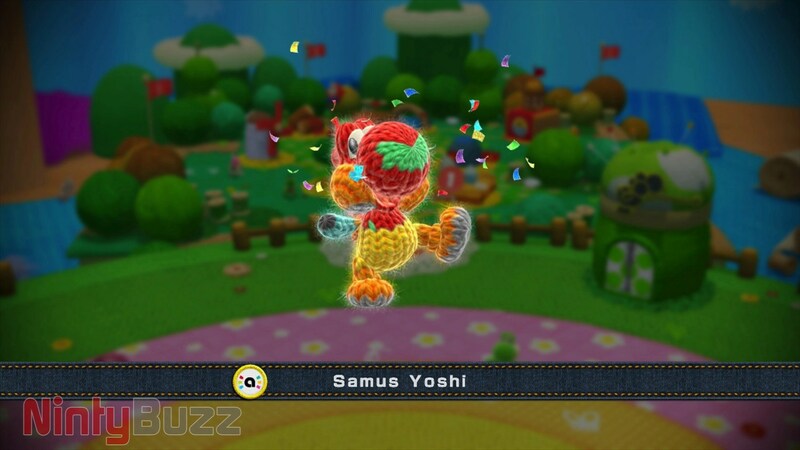 Overall, Yoshi’s Woolly World is a super cute and super awesome game which is pretty solid. Though the game still uses many concepts from previous games, that shouldn’t stop you from enjoying the mostly fun level designs, fun co-op, unique mellow mode and cute charm. If you find collecting a bit tedious, then you may not appreciate the game fully enough, though it is still worth a chance in any case. I give Yoshi’s Woolly World a 9 out of 10! Oh, for those wondering how long Woolly World takes to complete, I would say about 5 to 8 hours to get from the beginning to the end, but probably up to 12 if you want to collect every thing there is to collect… which I have yet to do! Yoshi’s Woolly World releases tomorrow (26th June 2015) in Europe and October 16th 2015 in North America, exclusively for Nintendo Wii U. Played it yet? Tell us what you think in the comments below! Here’s the music samples I promised you! Perfect for if you are having a little trouble with a particular course or if you are just addicted to watermelons. This part made me laugh out loud haha. Great review! 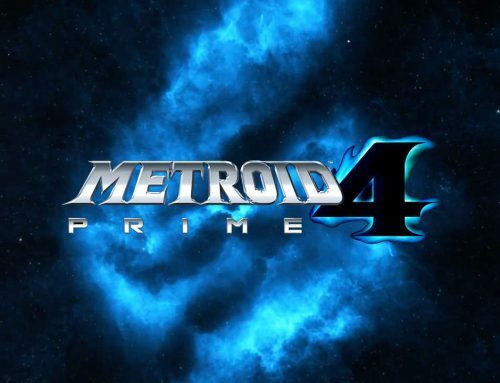 Very much looking forward to this game. You lucky Europeans get it so early!